Here are our machineries for Office, Spring and Lever Arch or Box File Making. We have specialse ourselves in this catagory. And we have use all our expirience and expertise to develope this machines. We constantly work on this machines for giving our customers our best product, so that customers can produce quality product without any problems and difficulties. Easy to use prgrammable creasing distances. Hole distance also changable for office or spring file. creasing distance and quality remains same in all batches of production. Fully digital control panel for creasing/hole distance programming. Runs on 1 HP electric motor with speed control. Rotary File Creasing Machine Rotary File Creasing Machine is specially design by Ajya Mistry And Sons for Better productivity for office and spring file manufacutring. This machine makes six or seven lines of files in one single pass at the rate of 60-70 files per minute.Distance between two creasings is adjustable. 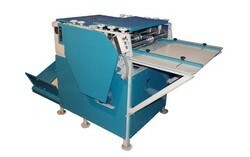 Machine also has inline folding attachement for folding the file at desire creasing. 28" Working Area" For Six or Seven Creasings in One Single Pass 60-70 Files Per Minute Creasing Creasing Distance and Depth Adjustable for each crease With Folding Attachment Speed Control Panel 1 HP Electric Motor. Ajya Mistry And Sons Semi Automatic Machine for Lever Arch Mechanism fitting. This machine fits all four eyelets of lever arch mechanism in one single stroke. This machine can fit 10 to 12 files per minute. This single machine can be use for manufacturing Box or Lever arch file. 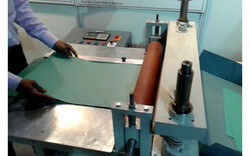 Box File Making Machine is used for manufacturing of Box File, All Types of Box files can be made on this machine. Then Two creasing of Box Files made on machine with File creasing die with the help of adjustable gauge on machine. In one hour 400 to 500 files can be creased . Then Ring Eyelet is fitted in Ring hole punched by machine by Ring eyelet fitting die. In One hour around 500 to 600 files can be fitted with Ring Eyelet. Then Rado Eyelet is fitted in rado holes punch by machine. Rado eyelets are fitted by rado eyelet die. Two eyelets are fitted at a time by die. In one hour 500 to 600 files can be fitted with rado eyelet. Then Two bottom side corners of box files are fitted by metal corner edge protectors by metal corner fitting die. One corner is fitted at a time. In one hour 400 to 500 files can be fitted with two corners. Only work remain now is fitting of Lever arch mechanism. This can be fitted by manual fitting by hammer and eyelet closing tool. Or our Lever arch Eyelet fitting Machine can be use for fitting Lever Arch Mechanism in file. This machine fits four eyelets in one cycle / stroke . In our eyelet fitting machine in one hour 600 to 700 file can be fitted with Lever Arch Mechanism. Means With Single machine production capacity is 1000 to 1200 files in 8 Hours. If Machine quantity is increased to Two or Three Production capacity can be increase. Our machine is fitted with Electro Magnetic Clutch which makes machine run without any noise. Also it runs trouble free for longer time. And it can be easily maintain locally by any electrician. Machine run on 1 HP single phase electric motor. Our Main speciality is the quality of out put Files due to quality of Die sets we make for file manufacturing. Our die sets for file making are made carefully with quality of out put keeping in mind. Our die sets work for many years without any trouble. Packaging Details: Wooden Packing 42" x 42" x 48"
File Master Machine for Cobra / Spring File Making. Make quality Files with best quality tools. Equiped with 1 HP Electric Motor, Operated By Electric Foot switch by Electro Magnet Clutch. This is a Multi Purpose Machine and can also be used for Index Cutting, Single Line Creasing, Spiral, Wiro Hole Punching etc. Also have Wooden Platdorm and gauges. Plastic File Making Machine is the machine used to produce PP, PVC Files. 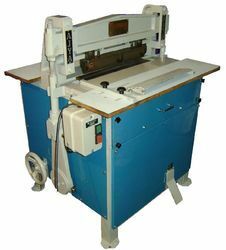 This Machine can Make creasing lines for folding, Hole Punching for File clip fitting, And Round corner cutting of Files. Looking for File Making Machinery ?